Christ is the Light of the World in this world of darkness! 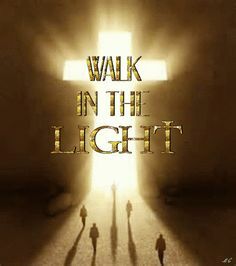 And we who follow Him walk in His Light. When we are in His Light, we have nothing to fear. Darkness then becomes obsolete. Christ has banished the darkness and when we are in His Light, there is no darkness. Christ the Light of the World has conquered darkness and sin. It is vital for us to love the Light and to stay connected to Christ. The moment we walk away from Christ and His Light, we will be engulfed in darkness and sin. Only with God’s Grace can we be connected to the Light of Christ. So, let us walk away from sin and darkness and stay connected to Christ, it is as simple as this. We can stay connected to Christ by praying and being in God’s presence 24 x 7.. The Mass is the pinnacle of prayer. Mass is a Celebration where we celebrate Christ. Christ Jesus died only once on Calvary. At every Mass we go into time and we are present at Calvary. We are there when Our Lord and Saviour Jesus Christ was betrayed, tormented, tortured and crucified. He died for you and for me. He died for the whole world and for all people. If we accept Jesus Christ as our Lord and Saviour, then Salvation is ours for free. The Mass is a powerful weapon against Satan and his wiles. The whole of heaven is present during Mass with all the angels and saints. At Mass, there are readings and the gospel – The Liturgy of the Word. We have the prayers of the faithful. At the Offertory, the priest offers the whole congregation to God – as we are, including our sinfulness. Liturgy of the Eucharist – When we receive Jesus Christ in Holy Communion, God, the Father, blesses us and a lot of graces is given to us so that we can continue to live for Christ and for what He stands for. At Holy Communion, we receive Jesus Christ Himself. Let us pray that Christ whom we receive in Holy Communion will make us a new creation and will make us more and more like Him. I will continue to write about the Mass as and when I feel prompted by the Holy Spirit.